I was in Myanmar when we walked into the dorm room. 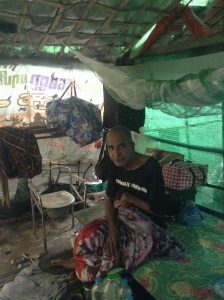 There were many elderly and disabled Burmese men in various states of suffering and the smell of sewage filled the air. The reason for that was because there was one very unwell and severely disabled man who was lying in his own excrement on a bed in the centre of the room. We learned that he had been left like that for months, because none of the local nurses were able to lift him up and give him the care he needed. This is hard for me to write about. Because although I helped people in whatever way I could while I was there, I couldn’t shake the feeling that this was not enough. I’ll confess….I was seconds away from giving up. 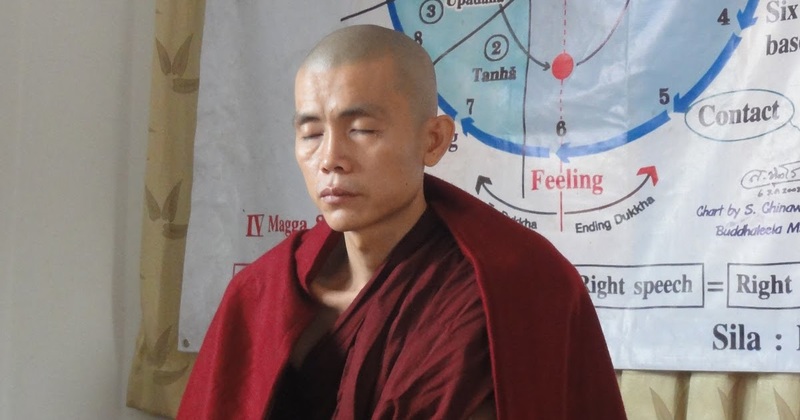 Although Sayadaw had done so much amazing work in setting up the ThaBarWa Dharma Centre to provide facilities for some of Myanmar’s poorest people, he also lacked the resources to provide the specialist care that some of them needed. Sayadaw Ashin Ottamathara is a famous Burmese monk who had thousands of devoted followers across Myanmar. His philosophy was that if you provide shelter, food and basic medical attention to people that would otherwise have none, then this type of good deed is enough. It did not come from a place of indifference. It came from his philosophy that everybody should do good deeds and that if everybody were to do this, the world would be a much better place. 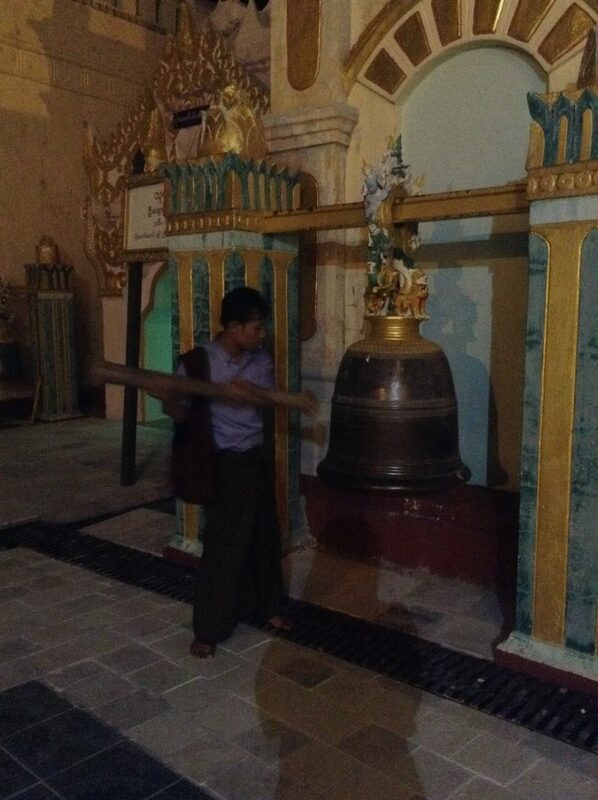 The temple was a safe haven for scores of impoverished and displaced people across Myanmar. It provides free food, schools and accommodation for its residents. It also provides free meditation. Much of it was like a large shanty town, that housed lots of poor people. In other parts, people lived in concrete dorms, which were large halls that accommodated dozens of people. Many of the residents at the ThaBaWa Centre lived in abject poverty. Yet it was still better than what they would have without the centre. The monks had slightly better accommodation, with fewer people sharing a dorm. It was still far from luxurious however. 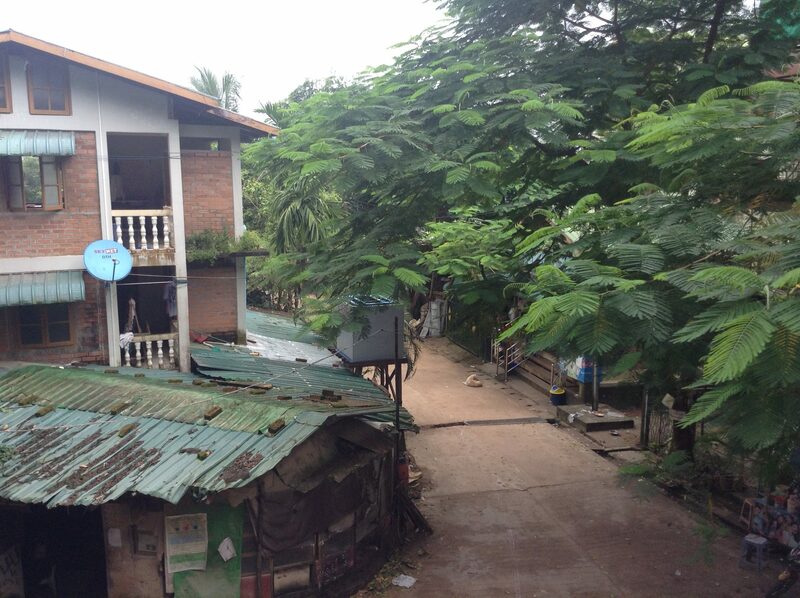 Even Sayadaw stayed in very basic accommodation. 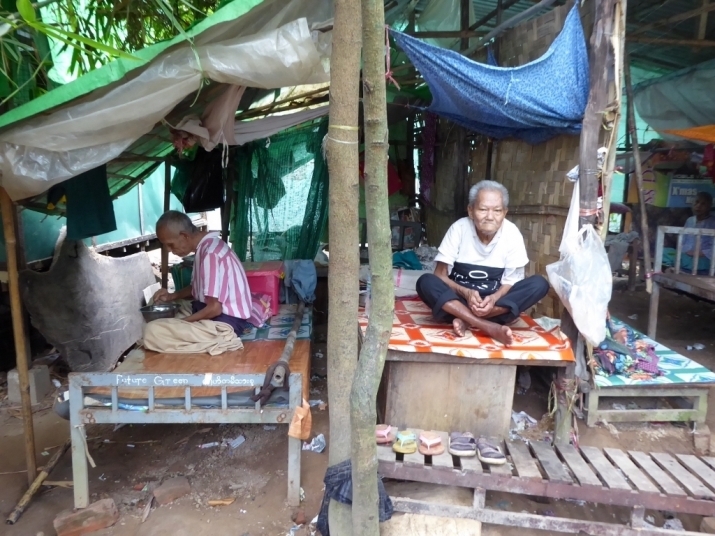 Sometimes, the accommodation was little more than a wooden bench with a plastic sheet over the top that got flooded whenever it rained. But for many of these people, it was still better than what they would otherwise have. It always puzzled me how the accommodation varied at the ThaBaWa Centre. The poverty was real. To me, it was a bit of a culture shock. It was one of those places where I felt bad for silently complaining to myself because I could plainly see that the conditions for me were still better than it was for the majority. But I couldn’t help the lingering thought that maybe this project wasn’t for me. The disorganised nature of the place also threw me off. There was no timetable, nobody to welcome me into the volunteers quarter to tell me what they needed help with and no direction. So I got ready to cut my losses and turn my attentions elsewhere. Soon after arriving, an old, American doctor known simply as Dr Cary appeared on the scene. He was very friendly and helpfully showed me around and suggested other volunteering activities I could get involved in. It helped to give me a little more structure to my stay. 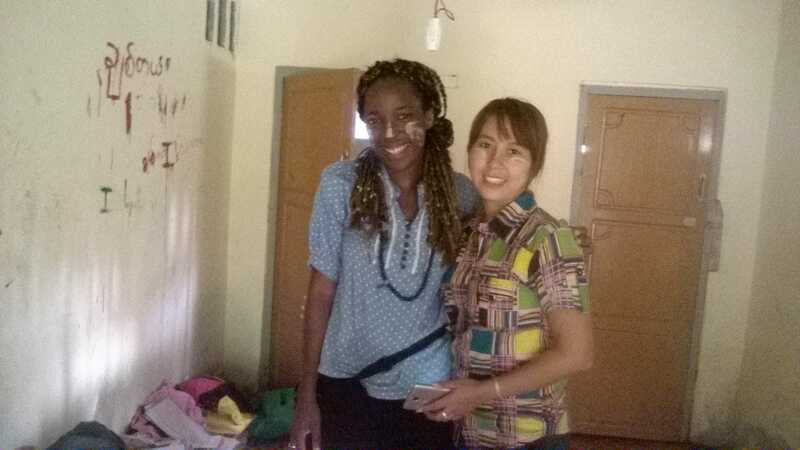 We had weekly volunteers meetings and in that meeting, I was approached by Moe, who worked very closely with Sayadaw. He was described as his right-hand man. He had heard I was a journalist who had expressed interest in writing about the ThaBaWa Centre. Sayadaw was due to leave the temple for 3 days to travel to the Burmese countryside, and Moe invited me to talk to Sayadaw for a few minutes, before he left. Within the first two minutes Sayadaw invited me to go with him – and I had exactly ten minutes to get a move on. He told me it would give me a chance to see how Burmese people live. Moe warned me that the journey would not be easy. 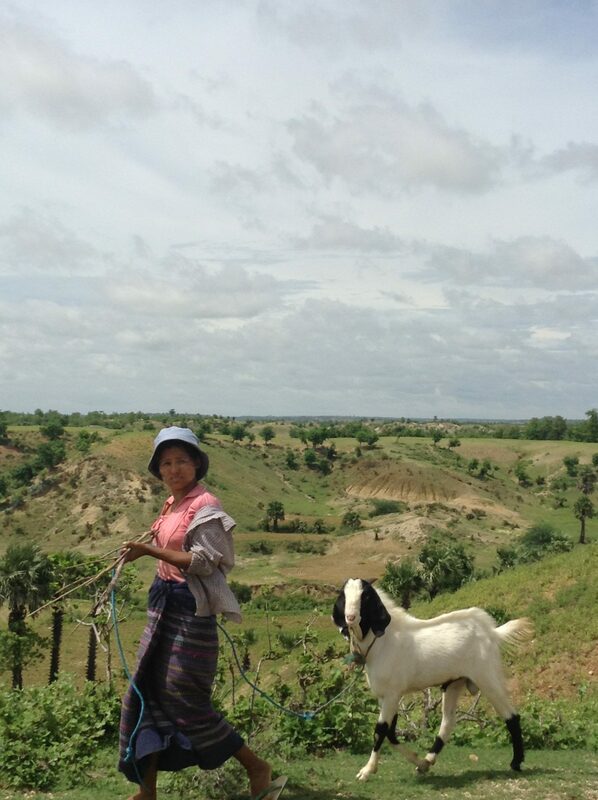 Rural Myanmar is impoverished and luxuries such as running taps, hot water and comfortable beds are few and far between. He said the journey would involve at least 16 hours in the car and bathing in vats by the side of the road. This scared me because I was already having doubts about my stay at the ThaBaWa Centre – which suddenly seemed a lot more luxurious than what Moe was describing. I started to say no but I agreed to go after a little prompting by Dr Cary. On the way back to the apartment, Dr Cary was almost furious at me for almost turning down the opportunity of a lifetime. “Do you know who that is?” he hissed at me. I never imagined that I’d be sitting squashed in the back of a car next to an American doctor and two monks travelling at breakneck speed across the Burmese countryside. It’s amazing how much can change within a few short minutes. 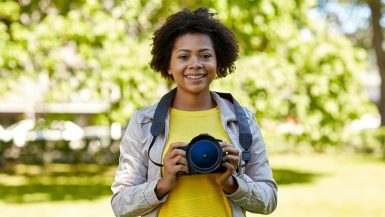 I went from being discouraged over a volunteering project that didn’t seem to be going so well, to buzzing with excitement about setting off on an uncertain adventure in the middle of the night. Tired and disoriented, we got out of the car to eat at a rest stop in the early hours of the morning. A crowd of curious onloookers quickly gathered around me as I got out of the car. 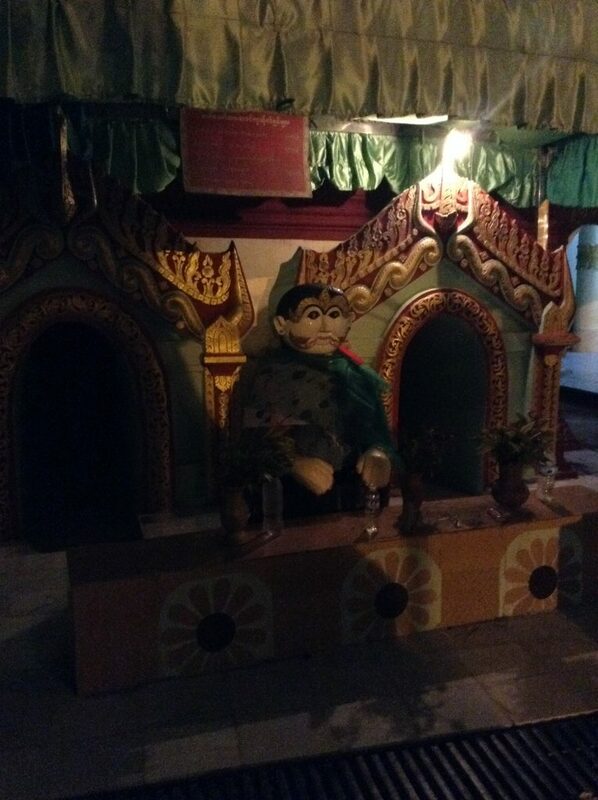 I was still feeling unwell from the food poisoning, and despite the generous monks offering to pay for my food, I could not eat. In fact, I could barely stand. After having about a dozen photos taken of me, we quickly gathered back in the car where I tried my best to fall asleep without snoozing on someone’s shoulder. The next day we arrived at the village and once again a crowd gathered around to see who this strange new person was that had just stepped into their village. Despite the language barrier, I quickly made friends around the village. One of them was a friendly lady around the same age as me and the others were adorable children who spent the next couple of days following me around the village. 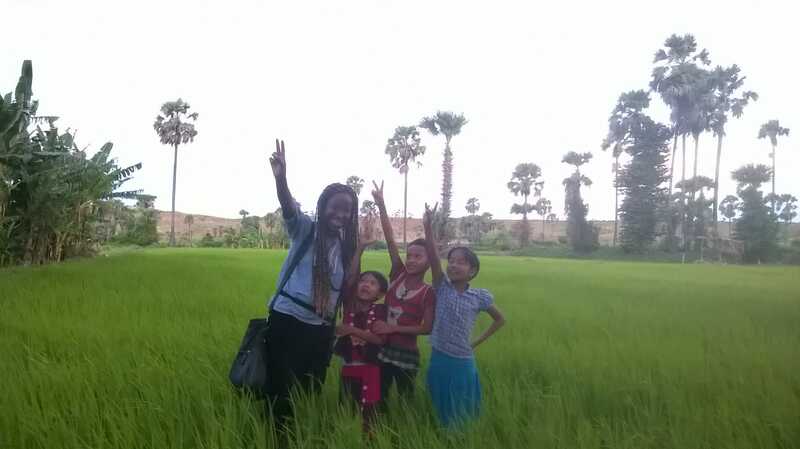 My new friends took me for a walk in some of the nearby fields, and after they set about painting my face with Thanaka. Thanaka is traditional Burmese cosmetic made from a yellow powder that is mixed with water to make the paste. It is used to protect the skin from sunlight and cool the face in hot weather. I met so many friendly people in the village. I wish I could remember her name. From there, the day was a bit of a blur. I started to wonder around the dusty roads in the village before sitting down for a delicious lunch with the congregation from the temple who had brought me there. Although the food was appetizing, I still couldn’t eat too much because of my weak stomach. 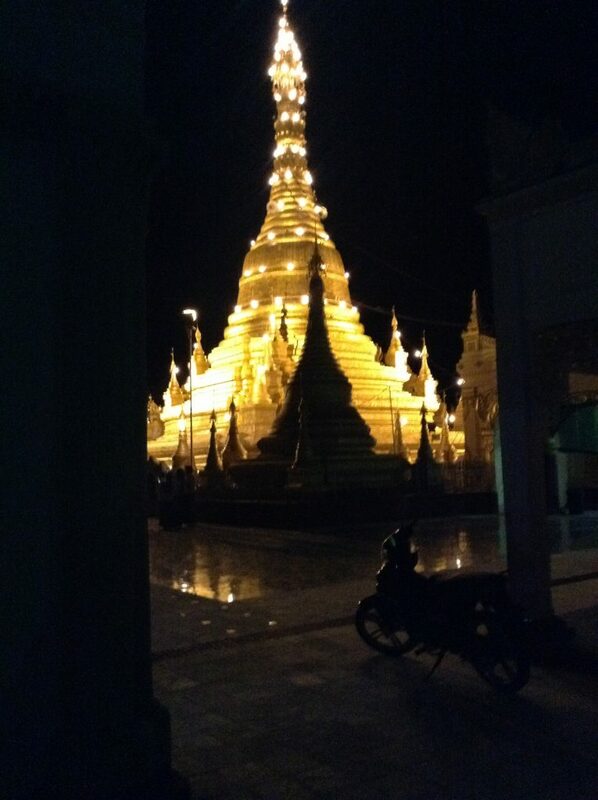 Showers of gold rained down on me as I looked up at the giant Buddha. Immediately, I tried to take a photo but the darkness prevented me. There was a young, inexperienced monk standing beside me. His hand lightly brushed against the smalls of my back. He’d been doing that since I first met him in the village. Yeah, he was weird. Although his religion forbade him, he was very flirtatious and he was too young to make a firm commitment to temple life. 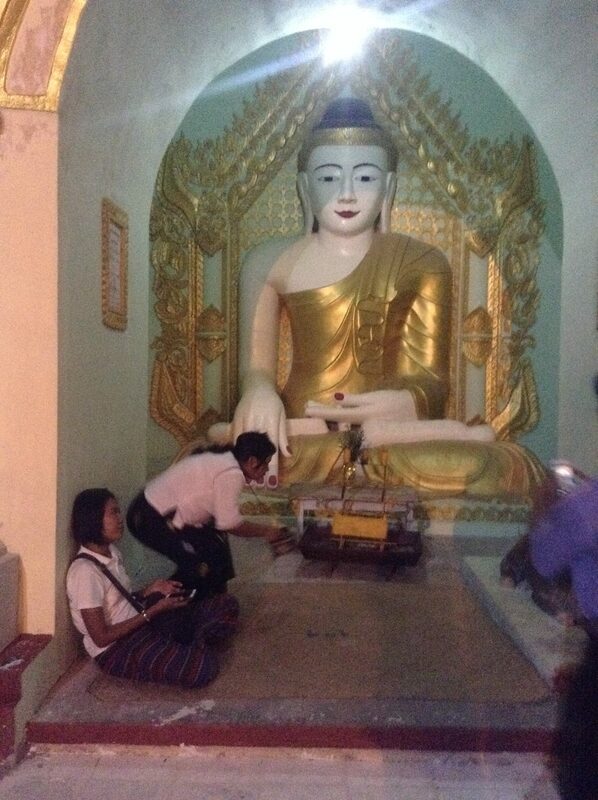 He asked if I needed a hand and took my smartphone from me, and made a few snaps of the Buddha. But Buddha knew best and remained concealed behind the darkness. 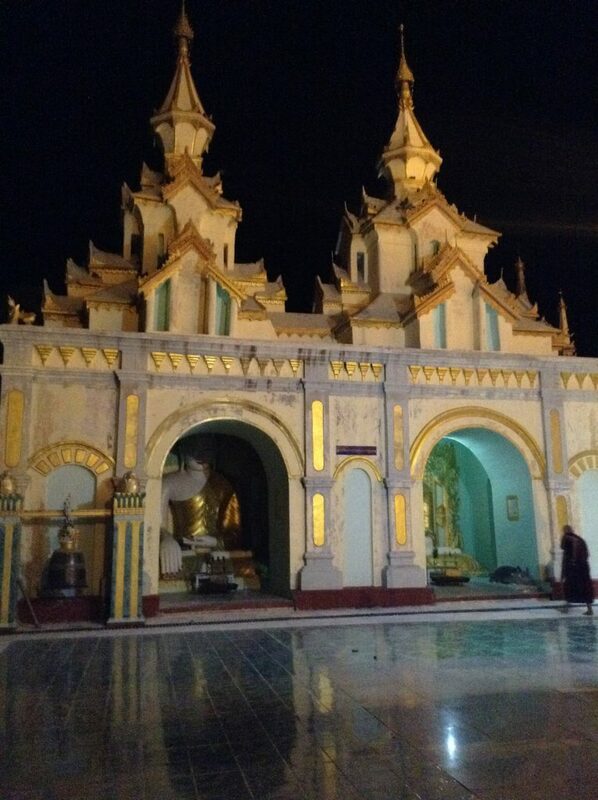 We’d arrived at this ornate, random temple in the dead of the night. Sayadaw was due to give a talk there. Something glittered to my left. 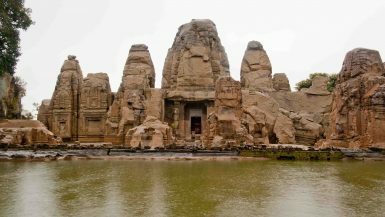 It was the lake that was bathed in some of the floodlights from the temple. I walked around and giant Buddhas and bells surrounded me. 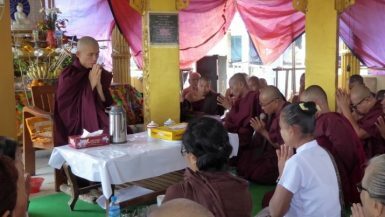 The senior monks ushered us all into an open space where Sayadaw addressed a crowd of what looked like hundreds of devoted worshippers. Some of those people were more than a little surprised to see this foreign looking tourist sitting there quietly in the back. I couldn’t understand what Sayadaw was saying to the crowd, but it really did make me wonder what he said in his sermons that drew so many worshippers all over the country. 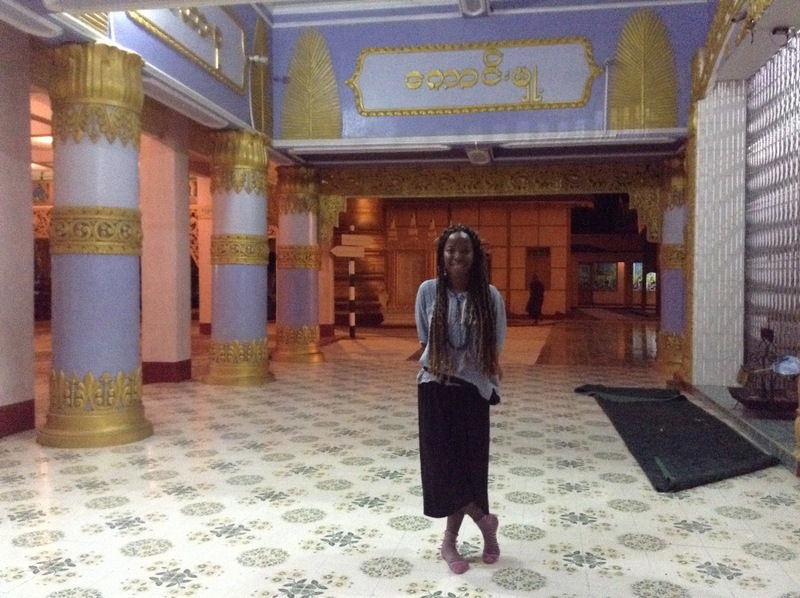 Interested in learning more about Myanmar? Ever dreamed of travelling the world? 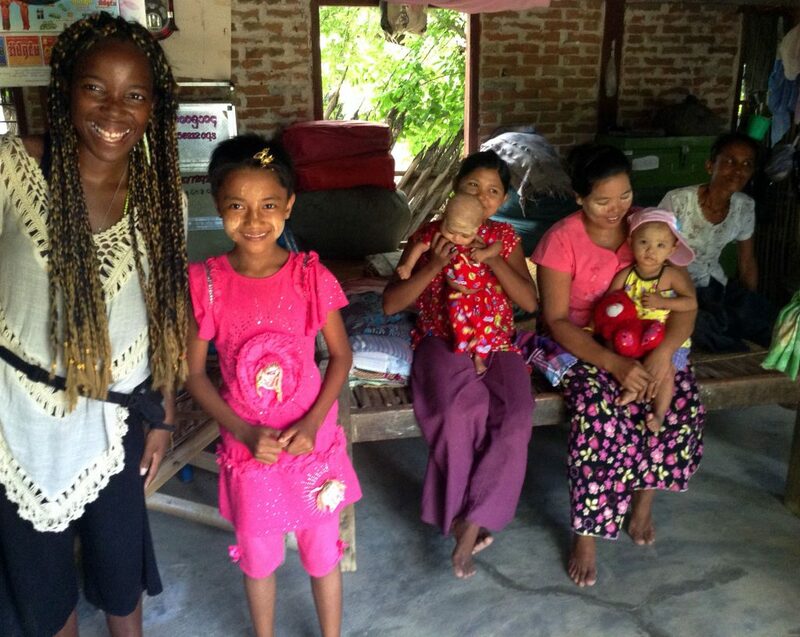 I share my tips and travel stories to inspire other people to do the same. And you don’t have to be rich either. I did it while I was broke and STILL have money to spare. Find out how and SUBSCRIBE to my blog. If you want to keep ahead of what is really going on in the world, consider join my Facebook & Twitter pages.